Strokes are the third commonest cause of death in the UK and about a third of people who have a stroke are left with disabilities. Though some people recover well from a stroke, there's no actual cure, as brain damage can't be reversed. Rehabilitation is the process of learning to cope and to function as well as possible with the damage that the stroke has caused. The goal is to help stroke survivors become as independent as possible and to attain the best possible quality of life. Strokes occur when blood flow to the brain is interrupted. In about 80% of cases this is caused by a brain artery blockage, in the rest by a blood vessel bursting and bleeding inside the brain. Blood supplies brain cells with nutrients and oxygen. When the blood supply is interrupted, brain cells are damaged and die. What Disabilities Can a Stroke Cause? Who Specializes in Stroke Rehabilitation? Multidisciplinary teams of professionals include hospital doctors, GPs, nurses, physiotherapists, speech therapists, occupational therapists, clinical psychologists and psychiatrists. Hospital doctors and neurologists have overall responsibility for managing and co-ordinating immediate care of stroke survivors, while GPs play an important role in the long term. 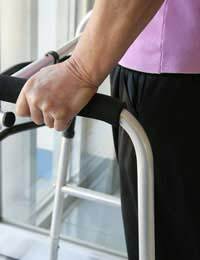 Physiotherapy is often begun very soon after a stroke, at home or in hospital. If the patient has difficulty moving, it is very important for the physiotherapist to position them correctly in bed and to change position regularly to stop muscles and joints from stiffening up. If limbs are weak or paralysed, then physiotherapy begins with small guided movements and practice of simple tasks and progresses to larger movements and more complex exercises. There is a natural tendency to overuse the side of the body that is unaffected by the stroke, and physiotherapists combat this by encouraging both sides to work together. Nurses care for the daily physical needs of stroke patients while in hospital, and in the long term for those who have prolonged disabilities. Turning and scrupulous cleaning of a bedbound stroke patient can be critical in preventing bedsores. Swallowing difficulties must be addressed, in order to prevent choking. Many people have difficulty with bladder and bowel control after a stroke, and specialist nurses trained as continence advisors can help bladder retraining to deal with these problems. Everyday activities and movements, like eating, dressing, washing and brushing teeth can be affected by movement, co-ordination and perception difficulties resulting from a stroke. Occupational therapists help stroke victims to develop compensatory strategies and practical solutions that enable them to function as well as possible, and become as independent as possible. They may change elements of the environment that limit daily activities. For example, they may work on eating and dressing using one hand, or recommend installation of ramps and handrails in the home and substitute Velcro fasteners for buttons on clothing. They often teach people how to divide a complex activity into component parts, work on each part, then put all the parts together. Stroke victims with dysphasia have difficulty in using and understanding language, while those with dysarthria find it difficult to move facial muscles and form words. Speech therapists help people to relearn words, or to find other means of communication, like gestures or word and picture charts. A stroke may affect thinking processes, concentration and memory. Understandably, it may also lead to emotions of frustration, despair, anger and hopelessness. Anxiety and depression are also common as well as dramatic mood swings. Clinical psychologists and psychiatrists can help with all of these situations, with medication, counseling, cognitive therapy or memory techniques as appropriate. Some scientists are studying brain reorganization after strokes and investigating whether specific rehabilitation techniques like constraint induced movement therapy and transcranial magnetic stimulation, can stimulate brain plasticity, improve motor function and decrease disability. Others are experimenting with implantation of neural stem cells, to see if they can replace the cells that died in a stroke. Although these techniques are still only experimental, they help to provide hope for the future.